Sandy wanted to take on a creative video project, but she couldn’t seem to get started. First she had to clean up her office, and that seemed to take forever. Then she found herself working out on the treadmill. Okay, she thought, now I’m ready to go. 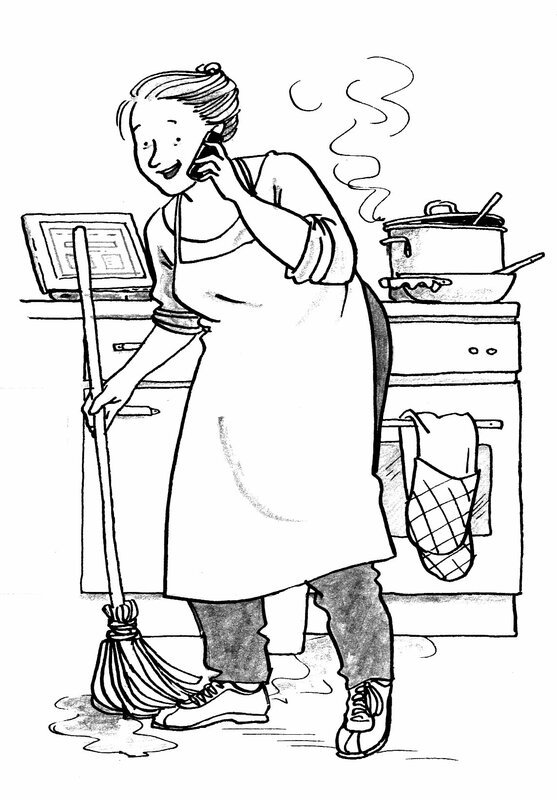 But instead of going to her office, she headed for the kitchen. Half an hour later, she was preparing a three-course meal. After a few days like this, she acknowledged to herself that she was avoiding the project. This procrastination made her feel vaguely negative about herself; she was undoubtedly lethargic and stuck. Sandy had a long-standing pattern of procrastination and depression, and now it was back. There is a part of Sandy that doesn’t want to work on her video project. She calls it the Busy Part. It keeps her busy with other activities as a way to avoid the video project, even though that project is her highest priority. The Busy Part is unconscious but nevertheless has the power to stop her from succeeding. Actually, the Busy Part has such power because it is unconscious. Since Sandy doesn’t know about it, she has no way to interact with it. A hidden part has extra influence because it can’t be addressed. It is like someone speaking ill of you behind your back. Rumors begin to fly, but you don’t have any idea where they came from, so you can’t confront the source. If we ask why the Busy Part operates the way it does, we see that several parts of Sandy are involved in her procrastination. 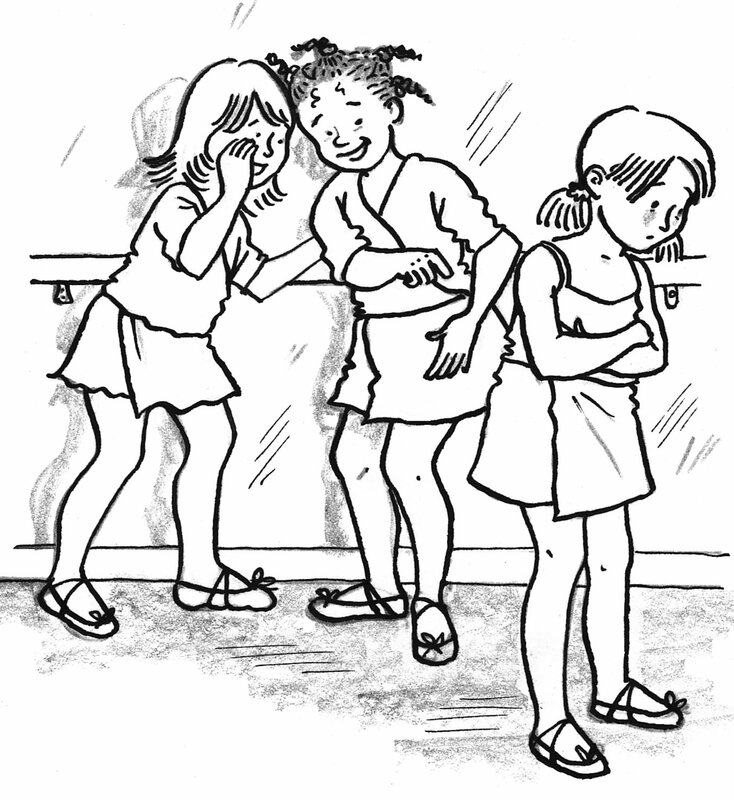 Sandy was ridiculed by her peers at certain times in her childhood when she did something that made her publicly visible. Now whenever she attempts to accomplish something that could make her visible again, an Embarrassed Child part is triggered, like an echo from her past. The Busy Part is not really Sandy’s enemy at all. It is just trying to protect the Embarrassed Child; it is afraid she will be ridiculed again if Sandy tackles this video project. There is also another force at work here. 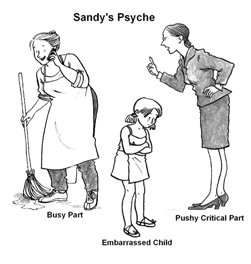 A third part of Sandy pushes her to work hard and criticizes her when she doesn’t. It is constantly on her case to “get working and be productive.” All this self-criticism is grinding her down, making the child part feel hated and worthless. So the Busy Part starts rebelling against this Pushy/Critical Part. It doesn’t want Sandy to be dominated by harsh judgment, so it distracts her with other activities. However, she can’t enjoy them because this Pushy Part keeps yelling at her in the background, punishing her for not working on the project. These parts are all extreme and are in serious conflict with each other. Sandy feels like a ship in a storm, buffeted here and there, without a center from which to understand herself and move forward. What she needs is a way to integrate those parts into a caring, cooperative whole so she can feel good about herself and accomplish things. IFS helps you find your center, pinpoint the parts of you that are causing difficulties, heal them, and unify them. Using IFS, Sandy would learn how to access her true Self, which is a port in the storm, a place of strength and compassion, and the source of internal healing. Her Self would connect with each of Sandy’s three parts in a loving way that allowed them to trust her. Following the IFS procedure, she could help them release their fears and negative beliefs, allowing their natural strengths to flourish. They would learn to cooperate with each other and support the unfolding of her life in wholeness. She could then move ahead with her video project passionately and without reservations. Read Taking Action: Working Through Procrastination and Achieving Your Goals. Self-Therapy Journey is an interactive online tool for psychological healing and personal growth that has a module on procrastination.